the gardiner's dirt: june first. 1982.
blondes came in to easy this morning at the expected 7am. "i want you to help me get mom some cereal." she whispered. "it's her birthday." so they went in together where she hand picked the coveted pink bowl and the princess spoon for me. 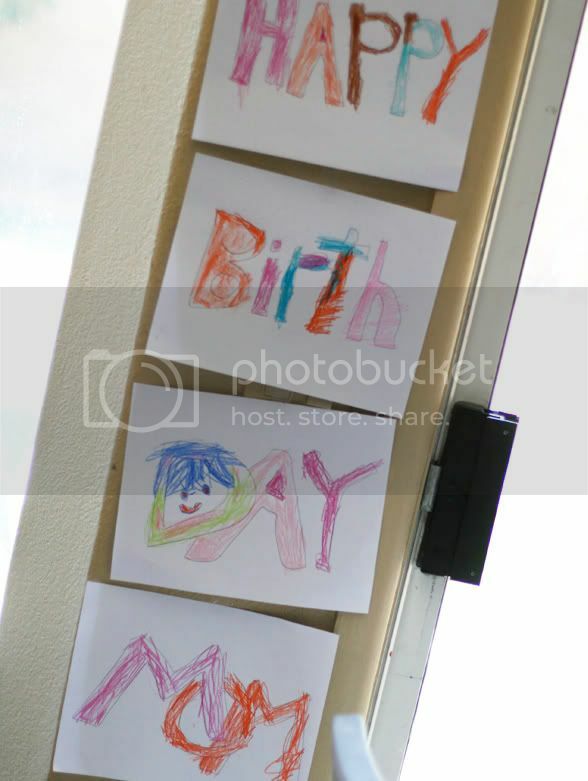 she colored me a traditional gardiner birthday sign and easy wrote me the perfect note. i think it's going to be a great day. Happy Bday Hays!! Love ya! Let's have a play date! Cute! I can't wait until Lila understands birthdays....this morning she just whined (haha....she has been sick all weekend, so I forgive her). I hope your day is great...it is fun sharing bdays! What the crap, I didn't know it was your bday today, I would have said something! Happy Birthday! happy brithday my dear friend. you know i love you so much. oh, happy birthday!! hope it's a good one! Happy Birthday girl!! Hope you have a wonderful day! Hope you had a great Birthday! The banner is fantastic!